One of my favourite articles within Bright Marketing is “the one minute brand test”. This simple technique gets you to think about how your business is perceived by others. 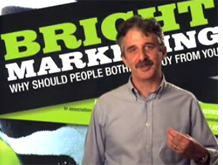 Please click here to visit Bright Marketing’s (Robert Craven’s) website, I strongly recommend buying this book. Going into the coffee break, delegates are instructed to take one of their business cards (or any other piece of marketing material that they might have with them, eg brochure, headed notepaper, compliments slip etc). They hand this to a conference organiser, who then staples the business card/marketing collateral to a blank sheet of paper. All delegates have to look at each others’ marketing material and write the first thing that comes into their head on the accompanying piece of paper. So what you end up with is comments from all the other delegates. The comments are normally one or two words and these observations provide incredibly valuable feedback about how the viewer/recipient sees your business. The comments are honest and independent (although they may not be from your target customers). Below is a sample of comments from a recent workshop. – What do all the letters stand for ? – What are you trying to say ? – Why have you got a hotmail account if you are a business … what does this say about you ? about how professional you do (or don’t) look ? So, what messages are you trying to convey, and to whom? Answer this question and you can then set about finding ways of communicating those messages. What Messages Are You Trying To Communicate? We constantly underestimate the importance of how we come across to other people. Often, we seem to measure and evaluate other people by one set of criteria and yet we don’t expect them to measure and evaluate us by the same high standards that we expect of them. All of our business communications (email, marketing materials, website, how we answer the phone, how we dress etc) send out messages to the outside world, whether we like it or not. To some extent we can choose which messages we wish to send out. If we try to look at our business through the customers’ eyes then we have the opportunity to select the most appropriate ways and means to communicate our intended message. Why wouldn’t you want to create the best impression that would get the most positive response from your potential customer? Redesign Snow Queen It’s a Jungle out there!